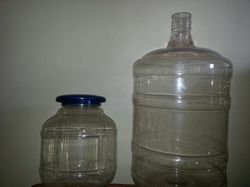 We are a leading Manufacturer of gallon water bottle from Rajkot, India. We are offering a wide assortment of Gallon Water Bottle to our esteem customers. Created using finest quality grade of raw material our products are extensively used for attractive designs, crack resistance and availability in various shaped and sizes. These 20 Ltr Water Bottle have been priced at very reasonable rates in the market. Looking for Gallon Water Bottle ?